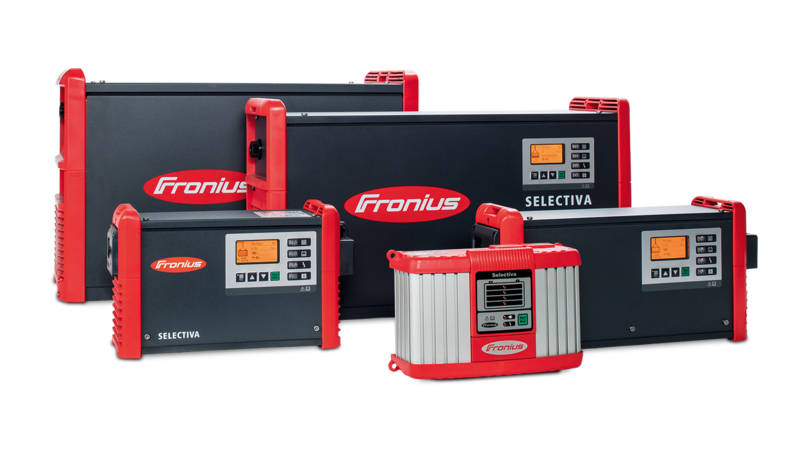 With the battery charging systems from the Selectiva range, Fronius is offering the best technology for charging lead acid batteries available on the global market. Our Active Inverter Technology guarantees an optimal and gentle charge, while the innovative Ri charging process adapts the charging characteristic to the age, temperature and state of charge of each individual battery. The benefits here are twofold: the service life of your traction batteries is significantly longer and you can dramatically reduce your energy consumption. The Selectiva range offers a comprehensive product portfolio for the charging of traction batteries between 2 and 80 volts. The devices boast a high level of energy efficiency and an extremely gentle charge, while maximum safety, simple operation and flexible installation also ensure smooth charging processes. As the user, you benefit from an efficient operation and maximum availability of your forklift truck fleet. The Selectiva devices are available with outputs of 1, 2, 3, 8 and 16 kW. Each power category comprises several models, from which you can choose the most suitable according to the voltage, capacity and charging time of your batteries. Active Inverter Technology developed by Fronius guarantees an optimal and gentle charge, while the new Ri charging process (available in the 8 kW and 16 kW power categories) adapts the charging characteristic to the age, temperature and state of charge of each individual battery. This minimises overcharging, reduces energy consumption and extends the service life of your batteries. Operating these devices is child’s play: a display and a multicoloured LED indicator allow the state of charge of the battery to be viewed at a glance. The device automatically detects the type and condition of the battery and independently adjusts all parameters accordingly, while a variety of additional functions ensure efficient operation under any conditions. Selectiva devices are also easy to transport and can be installed in the smallest of spaces thanks to their compact dimensions and low weight. An extensive range of accessories allows Fronius to adapt these battery charging systems perfectly to the respective application.